Sheet metal roofing is becoming a popular choice for commercial roofing thanks to its durability, energy efficiency and long life expectancy. New View Roofing specializes in sheet metal that’s custom-fabricated to meet the requirements of your commercial property. 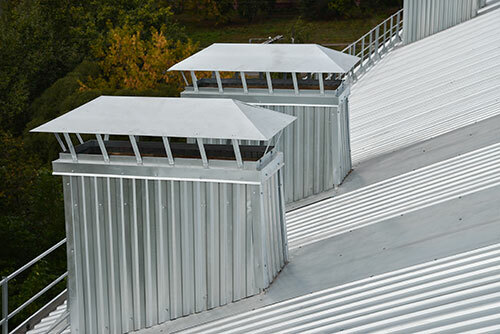 Durable Against the Elements – We offer sheet metal that is custom-fabricated for each application, which ensures it is built to meet the requirements and withstand the elements unique to the location of your facility. Sheet metal is resistant to chemicals, high temperatures and harsh Texas weather conditions. Compatible with Your Roof Components – Custom sheet metal will fit your roof’s form, including its specific shape and size. It also provides compatibility with existing hardware and other components of your roof. Efficient Installation Process – Since we’re able to optimize the design of sheet metal for each particular job, it’s possible to make the roof replacement process more effective and efficient. It’s our goal at New View Roofing to provide a hassle-free process for you every step of the way. This includes minimizing disruption of your daily routine. We’re proud to provide durable, long-lasting solutions for industrial and commercial roofing systems across the North Dallas-Fort Worth, TX, area. When it comes time for a roof replacement, we’ll help you find the right material and specialized treatment options for your building. Contact New View Roofing Today! New View Roofing provides quality products, friendly customer service and outstanding workmanship. To learn more about the benefits of custom sheet metal application and our other commercial and industrial roofing services, call (469) 232-7220 or fill out our online contact form. After submitting your request, one of our professionals will be on-site within 24 hours to provide you with a free inspection.